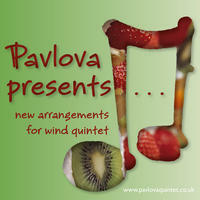 Pavlova Wind Quintet : New arrangements for wind quintet. Exploring unusual, exciting areas of the classical and non-classical wind quintet repertoire. George Butterworth is probably the best-known English composer who was killed during the First World War. Fearing that he would not survive it and endlessly self-critical, he destroyed any of his works that he thought inferior before he went away to fight. His fame rests mainly on three works: his settings of Houseman's poem A Shropshire Lad, an orchestral rhapsody with the same title, and his orchestral 'idyll' The Banks of Green Willow, written in 1913. Butterworth started composing very early, taking his first music lessons from his mother. While at Eton he wrote a number of pieces that were performed in school concerts there. He then went on to study at Trinity College, Oxford, where he met the pioneer English folk song collector Cecil Sharp and the composer Ralph Vaughan-Williams, with whom he later went around the English countryside noting down (occasionally using an Edison phonograph) folk songs that they thought were in danger of being forgotten. At Oxford he also met there the future conductor Adrian Boult, whose first professional engagement in 1914 involved conducting the premiere of The Banks of Green Willow. Butterworth was a keen folk dancer, eventually becoming a professional Morris dancer. He went on to teach music at Radley College, a well-known school a few miles south of Oxford, where there is a superb memorial to him in engraved glass. He joined up with the British army at the outbreak of World War 1 in 1914 and won the Military Cross during the early part of the Battle of the Somme in July 1916. On 5th August, the next month, he was killed by sniper fire at the age of 31. His body was immediately buried by his platoon in a make-shift grave, but has not been recovered since. His commanding officer was surprised to find out that he had been a very promising composer, saying of him: 'He was a brilliant musician in times of peace, and an equally brilliant soldier in times of stress'. The two songs used in The Banks of Green Willow were collected in Sussex in 1907. The second is called 'Green Bushes' (or 'Lost Lady Found') and was used by Vaughan-Williams and Percy Grainger in later works, while the main song, which gives the piece its title, has grim words somewhat at odds with the overall English idyllic sound-world of the work. The story goes that a farmer's daughter falls in love with a sea captain. She becomes pregnant by him and decides to run away to sea after stealing money from her parents. She gives birth on board the ship, but there are difficulties with no help at hand. Knowing that she is going to die she asks her lover to bind a napkin around her head and throw her and her child overboard. Rather shockingly, he agrees. He then sings a lament for his 'true love, whom I once loved so dearly, and who shall be buried on the banks of green willow'. The work is now considered an anthem to all 'Unknown Soldiers' of the War. As a composer, Elgar was a comparative late developer. If he had died at the age that Butterworth (and Schubert) did he would barely warrant a mention in dictionaries of music. It was not until he was in his forties that he achieved fame with larger scale works like the Enigma Variations (1899) and the oratorio The Dream of Gerontius (1900). Up to this time he was a composer of charming miniatures such as these, all originally for violin and piano. Chanson de Matin was probably written in 1889 or 1890 but was not published till 1899, serving as a companion piece to Chanson de Nuit published two years before. The orchestration of these two pieces in 1901 helped their popularity enormously. Chanson de Matin has a particularly fresh and enchanting melody, which, while not as profound as the Chanson de Nuit, endeared itself quickly to audiences and makes its adaptation to wind instruments very fitting. The title of La Capricieuse, composed for violin and piano in 1891, refers to a girl or woman who is moody, inconstant or whimsical, reflected in the flighty main theme and the ultra-romantic middle section. As Elgar was a trained violinist (and had originally wanted to be a concert artist) the piece was contrived to fall very much under the fingers - perhaps rather less so for wind-players despite John Newhill's arranging skills. Salut d'Amour was composed in 1888 as an engagement present for his future wife, Caroline Alice Roberts, and originally had a German title (Liebesgruss - Love's Greeting). It was dedicated 'To Carice', a contraction of her first two names, which name was given to their daughter. Elgar made three versions of this piece: for solo piano, violin and piano, and for orchestra. It shows Elgar at his most tender and, like the Chanson de Matin, lends itself very easily to performance on wind instruments. In the second half of the 19th century European classical music was heavily dominated by Germany. It was therefore quite natural for the Norwegian composer Edvard Grieg to study in the musical center of Leipzig. He impressed Liszt (who taught there), and later Tchaikovsky (who was on a visit to the city) with his ability to compose music of substantial emotional content that had an immediately discernible Norwegian flavor. While he was one of many nationalist composers of the time (such as Dvorak, Sibelius, and later, Bartok and Vaughan-Williams), he always remained outward-looking and considered his music European rather than narrowly Scandinavian. He was an early example of an artist taking a political/moral stance: he refused to visit France in 1899 for a concert tour in protest against the anti-Semitism exhibited in connection with the case against Captain Dreyfus. While his Piano Concerto in A minor and the Peer Gynt Suite remain endearingly popular, it is perhaps in his miniature pieces for piano that Grieg is most effective, particularly in the 66 Lyric Pieces for piano published in ten volumes. One of the best-known ones is in Book 8: Wedding Day at Troldhaugen, written in 1896 to celebrate his 25th wedding anniversary. Troldhaugen ('Troll Mound') was the house that Grieg had built for himself just outside Bergen, and which now houses a museum to his memory. The opening section is exuberant and joyful, and depicts the arrival of the guests who are offering congratulations and best wishes. The middle section is calmer and more reflective and contains some of Grieg's most beautiful music. The imitative calling cries out for the sonorities of different instruments that the medium of the wind quintet naturally provides. André Caplet is best known today as a close associate of Debussy, whose works he orchestrated and conducted. He was a highly original composer in his own right, however, winning the Prix de Rome in 1901 (beating Ravel!). He wrote mainly for voice (songs and choral works), but also for orchestra and for chamber groups, including Rêverie and Petite Valse for flute and piano, the first of which is here recorded for the first time in an arrangement for wind quintet. Written in 1897, the Rêverie displays advanced Debussy-style harmonies. The outer sections have a yearning, almost brooding quality, while the slower middle section is more positive and with ravishing impressionistic key changes similar to Debussy's Prélude à l'après-midi d'un faune. Caplet served as a soldier in the First World War, but was gassed and died of the resulting injury to his lungs a few years afterwards. Gloucester-born Ivor Gurney displayed exceptional talents as a musician in his youth, going on to study at the Royal College of Music under Charles Villiers Stanford, the teacher of Vaughan-Williams, Frank Bridge and Arthur Bliss amongst others. He was declared the 'biggest of them all' by Stanford, but also 'unteachable' because of his volatile personality and deep mood swings, which plagued him all his life and led to him spending the last 15 years of his life in a mental hospital. He is now remembered however as one of the great WW1 poets, with much of his poetry written while he was a soldier at the front. He was wounded and gassed in 1917 and invalided out of the war. While his poetry is celebrated, his musical compositions (songs, orchestral pieces, chamber music) have received less attention, with nearly two-thirds of them being unpublished and unrecorded. His piano preludes, here arranged for wind quintet, were written in 1919 and 1920, in a rich, late-Romantic style, quite untouched by either the current vogue for folk music or the acerbic style of the modern neo-Classical composers. They are delicate miniatures, full of tenderness and redolent of Schumann, yet somehow still as English as Elgar. Tchaikovsky was called 'the most Russian of all composers' by Stravinsky. Though he was not an avowed musical nationalist, unlike the members of the 'Five' (such as Rimsky-Korsakov and Borodin), his music expresses the yearning and overwhelming sadness of the Russian spirit even in music which is overtly cheerful. In 1875 Tchaikovsky was commissioned to write a series of 12 piano pieces for a monthly musical magazine called Nouvellist that was published in St Petersburg. Each edition during 1876 featured a new piece appropriate to the time of year. The editor supplied each of them with a subtitle and a short poem (January features one by Pushkin, no less!). The resulting suite was published as opus 37a The Seasons. The most popular ones are June and November (the latter was a favorite encore of Rachmaninov). At the time of their composition Tchaikovsky's 1st Piano Concerto had just been given its first performance, and he was working on the ballet Swan Lake. There have been many arrangements of these pieces, especially June, both for orchestra and for diverse solo instruments. Tchaikovsky was not mainly a piano composer but tended to think orchestrally, thus making the task of transcribing for wind quintet relatively easy. When playing his piano pieces you are constantly aware of allusions to orchestral sonorities. June reminds one slightly of Mendelssohn's Venetian Gondola pieces in his Songs without Words, November features jingling sleigh bells, while December is a salon waltz much in the style of his grand ballet ones. November: 'In your loneliness do not look at the road, and do not rush out after the troika. This is an arrangement made especially for the Pavlova Quintet by the English composer Lionel Sainsbury of his two piano pieces dating from 1991. Sainsbury's music has been described by the press as "striking", "passionate", "ethereal", "beautifully crafted" and full of "beautiful musical ideas". Born in Wiltshire, England, he started to play the piano at an early age, and soon began to compose his own music. He studied privately and at the Guildhall School of Music and Drama in London, where he won the major prizes for composition, and while still a student was also awarded the UK's prestigious Mendelssohn Scholarship at the age of 21. He has written large-scale works for piano (he himself is a virtuoso pianist), often in a Latin-American idiom, as well as a violin concerto (recorded in 2002 by Lorraine McAslan and the Bournemouth Symphony Orchestra) and a cello concerto (recorded in 2012 by Raphael Wallfisch and the Royal Scottish National Orchestra). The languid Cuban Dance no. 2 was also arranged by the composer for violin and piano, and is featured on violinist Tasmin Little's CD of virtuoso encore pieces, 'Tchaikovskiana', released on EMI Classics for Pleasure in September 2003. It has become a frequent encore piece for the violinist, Tasmin having performed it all over the world since premiering it in 1992. The work has also recently been recorded by the Royal Ballet Sinfonia in London in the composer's own orchestration. His expert version for wind quintet of both dances is notable for the rich orchestral sonorities he creates from the medium. This album features not just my own arrangements but also the work of three other performing musicians. Lisa Portus is a bassoonist who has now compiled an impressive list of fine arrangements of the most diverse repertoire. The Pavlova Quintet has often played clarinettist John Newhill's arrangements with great enjoyment, especially his Christmas Carol suite and these lovely Elgar transcriptions. Lionel Sainsbury brings a wealth of experience of composing for orchestra to this, his first (and very successful) foray into arrangement for wind quintet of his own music. Transcribing music from one medium to another is somewhat like translating poetry and raises the same issues. The explorer Gertrude Bell, who was active in the Middle East in the early part of the 20th century, among many other accomplishments translated ancient Persian poetry, and went about it in an unusual fashion. Rather than trying to translate the original faithfully she decided to recompose the poetry in English but offering the same 'message'. Often while re-thinking piano music into the medium of the wind quintet I am confronted with the problem of how literal I should be with the transition. Choosing which pieces to work on is perhaps the most important step, and I have mostly been inspired by playing piano works that seem to lend themselves to this very different sonority. A good sense of melody and line is essential, and the more contrapuntal the texture the better. The piano is basically a percussion instrument (at least according to Stravinsky) while the wind quintet consists of five very individual sonorities geared more to sustained melody. The differences of tonal quality between the double-reed oboe and bassoon, the single-reed clarinet, the French horn (a member of the orchestral brass section) and, very much out on a limb, the soft-toned flute, make blending very difficult. But it can be put to positive use by offering a contrast of timbre where the original piano music is a little repetitive, as in, for example, Tchaikovsky's 'June', where I consciously gave the solo line to different instruments to create variety, sending in the process the bassoon up to top C in the style of the opening solo in Stravinsky's The Rite of Spring! Other issues that arise are the question of whether one should keep to the original key or not. Increasingly now I am prepared to transpose a piece in order to achieve the same effect in the new medium. What is convenient for piano may not be suitable for wind instruments, even though the modern instruments are technically entirely chromatic. In the Gurney Preludes for example, I have changed the key of the two preludes in F# major to more friendly ones for wind instruments. I also often enjoy putting something 'extra' into my arrangements that is not in the original, such as the replacement of the somewhat formulaic rising arpeggiated chords to a climax at the end of the central faster section of Tchaikovsky's June with upward rushing scales/arpeggios in diverse rhythms played by the wind instruments, thus giving a more 'chaotic' feel, culminating in a piercing top C# on the flute! Regarding the nitty-gritty of arranging there is the problem of how much one should dictate and set out in detail markings such as dynamics and articulation. I believe it is important to think of the natural characteristics of each instrument in these areas. The oboe and bassoon are louder at the bottom than at the top of their range while the flute is the opposite. Slurring may be difficult over large leaps and such markings may have to be changed from the original. Tempi may need to be modified to be playable on wind instruments. Breath points may need to be marked explicitly. It is tempting to be over-directional in markings though, especially if the arranger has strong opinions about interpretation, but I also feel it is important to give individual players of different groups some opportunity to formulate their own interpretation. Clarity in the parts is a prime consideration, so I try to avoid excessive dynamic and articulation markings that could get in the way of efficient reading. I hope that all the arrangements on this disc will both give pleasure and, in the case of familiar works, give some new insight into the music when translated into the colorful medium of the wind quintet. License Exploring unusual, exciting areas of the classical and non-classical wind quintet repertoire by Pavlova Wind Quintet for your project. Play the music of Pavlova Wind Quintet in your restaurant or store.